BuffMonitor is a plugin to monitor any effects. All you need is at least a unique part of the effects name. 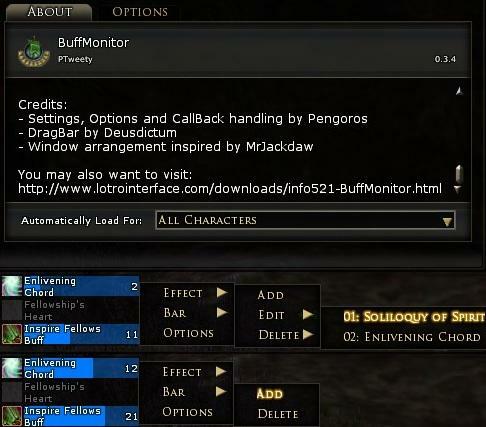 Install the plugin into your Documents/The Lord of the Rings Online/Plugins folder. In game load the plugin by typing /plugins load buffmonitor. To get some help type /help buffmonitor. Right click on the empty effect window to show the context menu and add your first effect. You can use a simple, case sensitive text as search string (except the magic characters ^$()%.*+-?) but you may also want to check for patterns. i.e. Escape magic characters with %, i.e. %x (where x is any non-alphanumeric character) represents the character x. Find multiple characters ([...]), e.g. any of the numbers 1, 2, 3 are found by . For more information see the Lua documentation, Chapter 5.4.1. Ah great! Thanks, that worked and helped a lot to modify some more Gambits. A Question about "Schild-Taktiken": it still will not show up or did i miss the correct wording for it ? Can you please try to escape the - with %: "Schild%-Taktiken"
Can you please specify where exactly in the effectitem.lua these changes have to be made ? That would be nice since i'm not so comfortable with programming Lua. This should not be neccesary any more. Please have a look in the options panel (/bm options) under "ui elements". Great Addon, thx for making it! Last edited by Drinjok : 12-02-2012 at 05:29 AM. Nice plugin! Only thing is, for some reason I need to resize it every time I log in so it displays right......maybe it's because I play windowed. Well, this is a bug that only occurs if you autoload the plugin with the turbine plugin manager. In my local copy it's already fixed and i will upload a new release after i did some more testing. I really like this plugin, but the coloring is just completely backwards to how I think. This is a great program for wardens. 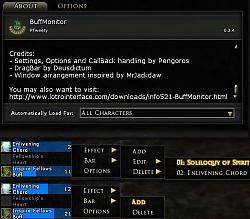 It allows you to add your buffs and see when they need refreshed. I have 1 small problem with this plugin, it seems to resize the text boxes and I can't get them back without dragging the text box size out and back again. 1 Suggestion, it would be great if we could separate the buff search string from the description. Some of the buff names do not match the gambit name and it would be nice if I could add the numerical code for the gambit to the name. For instance the buff called Dance of war - Evade I would like to be shown as Dance of war - Evade 2323. Another example, the buff is called Enduring Shieldwork but the gambit name is persevere. If you could somehow allow us to enter a custom name separate from the searched name. Great plugin, thanks for your hard work. Anyway, I'd like to see some effects to be added in it. For guardians, challenge/fray the edge, those kind of skills where you put something on mobs which aren't really a debuff, if you know what I mean.......aside this, it's really great! This has not been working for me since the release of Rise of Isengard. Hm, I'm using it all day long with no changes made since release of version 0.3.2. Do you have some error messages? Oh my giddy aunt. I am so sorry I commented here. Had a bit of a stupid moment... Sorry! Last edited by MrJackdaw : 10-06-2011 at 10:30 AM. Last edited by whitespace : 08-16-2011 at 06:07 AM. 1. Is there a way to add the cooldown of a skill rather than the skilleffect itself? 2. Is there a way to make the windows transparent when not used? 1. Without serious, and very inaccurate, fudging we cannot tell when a skill fires, unless it actually buffs the user. So, no, with a hesitant and pointless yes. bumping these two questions up again. Last edited by Kylina : 05-21-2011 at 06:17 PM. So it ends up with the three monitor lighted up when at full tier.. only 2 when at tier 2 etc .. you see the picture, this was working wonderful on 0.3.0 and before. Well, I checked your setup with my own minstrel and believe that I have found the bug. It would be nice if you try 0.3.2 and report back.